If you only ever get one picture book about fly fishing, make sure this is it. 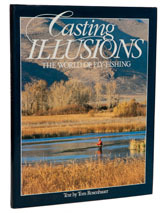 Casting Illusions is a classic and if you aren't totally gripped by the sensational photography by page 6, you should take up golf. This is the book that made me visit America. It contains my all time favourite fishing photograph (Valentine Atkinson's rainbow in a net on page 66) as well as the next dozen runners up. It is no exaggeration to say that some of the shots will stay in your memory for ever. The book was reprinted in 1997 in an expanded and revised version - this I have not seen, but I guess more of the same can't be bad. But the first edition is pure, unadulterated gold.